Welcome to the slowdown. It isn’t much – yet – and it may just be a passing phase, but there is little doubt that the US economy has slowed somewhat. The rise in short term interest rates has stalled and the long end of the curve has rallied. The result is a flatter yield curve but it isn’t the flatness that provides us with information so much as how it got there. 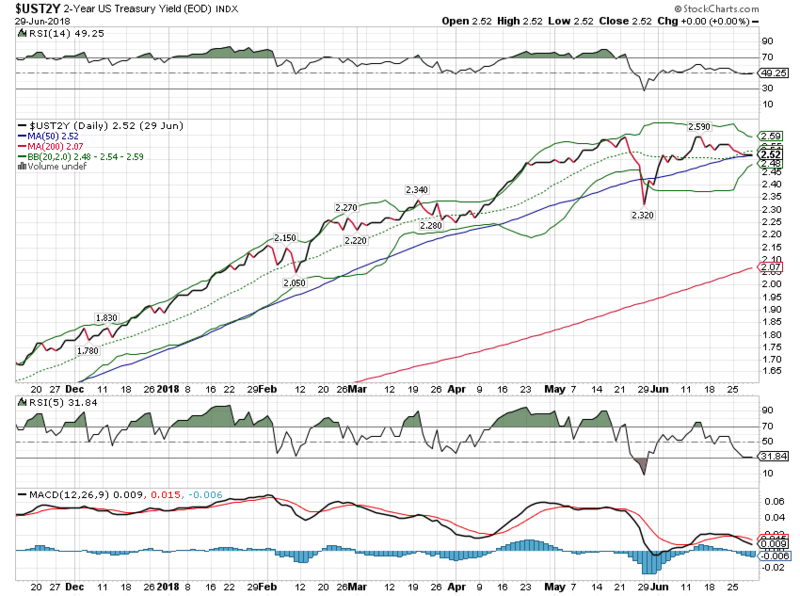 The stall in short term rates tells us the market is getting skeptical about the Fed’s rate hiking path. The Fed may think it is going to hike twice more this year but the market has serious doubts. In the last report I highlighted the change in the futures market positioning for the 2 year note. The short position had been covered and speculators were actually long the 2 year. And that is still the case and as expected. Futures markets tend to swing between extremes and it would not be odd to see a significant long position in the 2 year note before this is over. I would also expect to see Eurodollar futures positioning – where specs are still quite short – to shift. As for the long end, the speculators are still quite short the 10 year Treasury so that long-end rally probably isn’t over. But a large change in positioning would require that the economic data continue to weaken and I’m far from sure that is in the cards. The economy, even after showing signs of slowing, is still growing above trend according to the CFNAI and I think that is largely correct. Q2 growth will probably be better than Q1 but I’d also caution all the economic bulls that the Atlanta Fed’s GDPNow estimate is probably too high. I won’t go into the technical details but suffice it to say that the underlying inputs to that model have also started to moderate. There are also some special factors to consider. There was a fire at a major auto parts manufacturer that has had a significant impact on auto production. This impacted the industrial production numbers, factory orders and durable goods orders, all of which are inputs to the CFNAI. Auto sales may have peaked already but the most recent figures (which were actually released after the data collected for this report) showed sales back above the 17 million SAAR. That is consistent with past cycles; sales hit a peak and then trended flat until the onset of recession. If this was the main cause of the slowdown then a rebound seems highly likely. What we don’t know yet is the impact of the tariffs the Trump administration is imposing on the rest of the world. As I write this, the deadline for the Chinese tariffs has passed and more tariffs are being imposed. China is announcing retaliatory tariffs that are expected to impact mostly, but not exclusively, US farm products. Canada is also imposing retaliatory tariffs and absent a deal on autos it seems likely we will see more friction with Europe as well. I feel quite comfortable in saying the impact on the US and global economy is negative but quantifying the impact is impossible at this point. We’ll just have to wait and see. I would also point out that the auto slowdown isn’t the only negative we’ve seen in the numbers. Income growth remains weak and there is an obvious slowdown in consumption. Personal consumption expenditures in May were flat after accounting for inflation and the savings rate ticked higher. There are some offsetting positives too though. Core capital goods orders were up strongly last month and the year over year change is decent if not spectacular. I’m still skeptical that we’ll see a big surge in capital spending due to the tax cuts but I’m open-minded. I’d rather be skeptical and surprised by a positive. One last thing to consider is the positioning ahead of the tariffs. We know that a number of these reports were skewed by companies trying to get ahead of the aluminum and steel tariffs; companies pre-ordered raw materials to avoid the coming tariffs. What else was accelerated due to the anticipation of tariffs? The fact is that we don’t know and so we don’t know how much these reports have been distorted. If the tariffs stay in place for an extended period of time we’ll certainly find out. As for the odds that the tariffs stay in place I have no idea. The President and his surrogates have said repeatedly that this is a negotiating tactic but I’m not sure it works all that well if the whole world knows it’s a tactic. I guess we’ll find out because, as Yoda might say, begun the trade war has. The CFNAI confirms the slowdown we see in our market-based indicators, falling into negative territory over the last month. The three-month average is at 0.18, an indication that while the economy may have slowed it is still growing slightly better than trend. The LEI also looks to have peaked, another confirmation of a slight slowing in activity. Q1 GDP was revised lower – a bit of a surprise – but that is a lot less relevant than Q2 growth which is looking better. Both of these were, however, impacted by the fire at Meridian that shut down some auto production. So, the slowdown is real but it may not last long. Existing home sales are down year over year as price rises seem to be putting a damper on sales. Inventory is rising, now up to 4.1 months of supply at the current sales pace, though that is still fairly lean. Existing home sales are not a big part of current growth – new home construction and sales are much more important even though they are smaller – but resale stagnation is still not a positive sign. Personal income rose a decent 0.4% for the month with wages and salaries up 0.3%. But higher inflation means real incomes barely budged and spending (more below) was flat on a real basis. The savings rate ticked a bit higher to 3.2%. These survey-based reports are again outrunning the reality of the hard data. Sentiment does play a role in economic growth but we’ve seen in the past that it can turn on a dime. 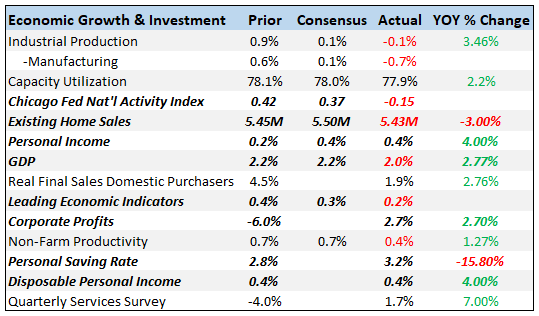 Consumer spending was less than expected and most of the gain was in non-durables which translates mostly to gas. In other words, it’s nothing more than inflation. The surprise was in services up just 0.1% and durable goods, also up 0.1%. Real spending, after adjusting for inflation, was flat. Durable goods orders were down in May but year over year gains are still pretty good. Aircraft orders, which we don’t pay a lot of attention to normally because they are so volatile, were down for the second straight month. Is that a tariff/trade issue? Maybe, but it seems a little too soon to make that call. Core capital goods orders were down but last month was revised significantly higher. I still don’t think we can say that capital spending is picking up in any meaningful way but with C&I loans recently picking up, it may be coming. Exports were up a big 2.1% in May but trade/tariff fears are all over this report. The biggest gainer was foods and feeds an obvious response to the threat from China to retaliate against US farm products. Capital goods exports were also up but I’m not sure if that reflects trade war fears or real demand. On the import side, autos were down 1.2% and consumer goods down 1% as well. Capital goods imports were up 3.4%. I continue to see the trade/tariff threat in these and other reports. These one-time moves make it hard to read the underlying demand in the global economy. But if the tariffs do go into effect and other countries retaliate, it will be interesting to see how rapidly these reports change. One would assume that higher taxes will reduce trade but the magnitude is hard to judge. We may be about to find out. Inflation is basically at the Fed’s target with Core PCE coming at exactly 2% year over year. Powell has indicated though that running a little over the target is not something that will upset the FOMC much. Nothing in the inflation reports seems likely to change the current course of monetary policy. House prices are still rising but the rate of change seems to be moderating some. Considering the pace of existing home sales that makes some sense. If houses aren’t selling because prices have risen too far, too fast then lower sales would logically start to cap price rises. Jobless claims are still tracking at very low levels. I would expect these numbers to rise modestly if the slowdown persists but so far there is nothing concerning in claims. 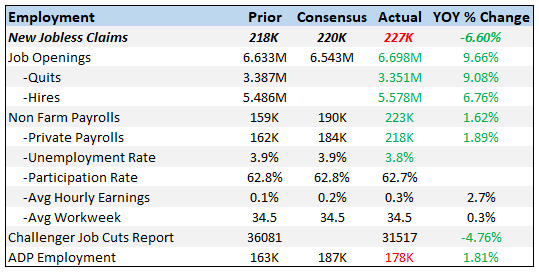 Housing starts and new home sales were both better than expected and year over year gains are very healthy. Permits were slightly lower but nothing out of the normal volatility we see in these numbers. On starts, single family and multi-family were up 3.9% and 7.5% respectively. Permits were a near mirror image of those numbers with both down. But again, permits are more volatile than starts or sales both of which are also volatile. The trend is obviously up. Expectations and outlook are down in the Consumer Sentiment and Consumer Confidence reports but both are still at high levels. 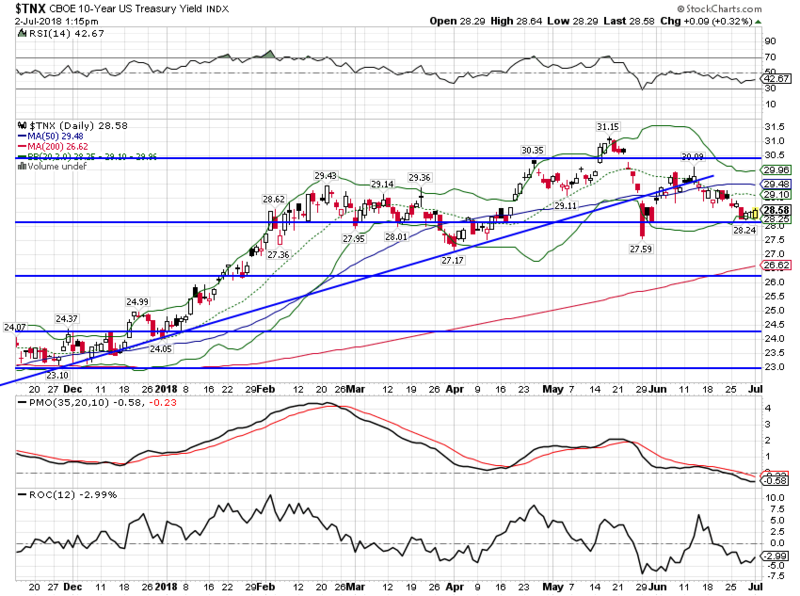 The 10 year Treasury yield has fallen since the last report and is now basically unchanged since February. This change appears to be more about real growth and less about inflation (see TIPS below). 10 year breakeven inflation rates fell by just three basis points since the last update. TIPS yields were down 8 basis points over the two weeks since the last report. Real growth expectations have fallen modestly since peaking in mid-May. This is probably the most interesting part of the curve right now for what it says about market expectations regarding monetary policy. The 2-year yield has stalled even though the Fed has given no indication they intend to slow down the pace of tightening. The market is questioning whether the economy will allow them to stick to their schedule and hike rates twice more this year. 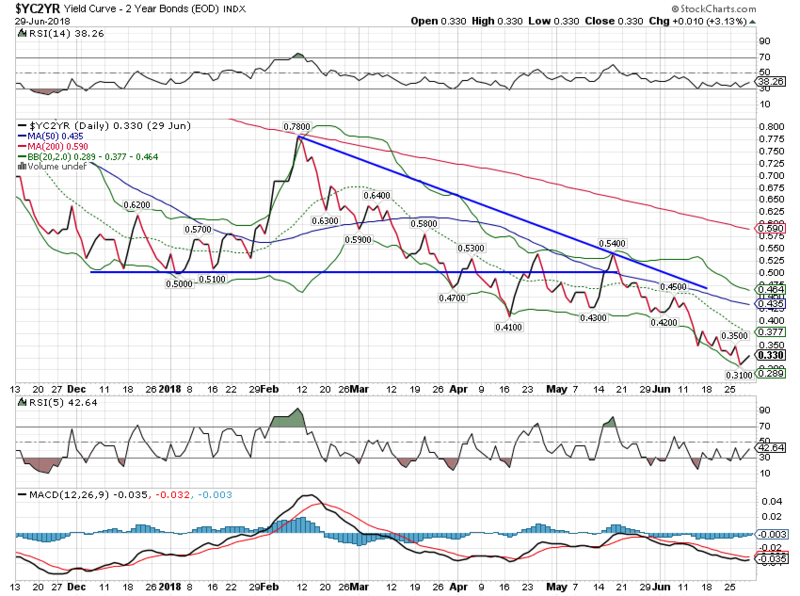 The yield curve has continued its flattening even after I posted this chart. The 10/2 spread is under 30 basis points now and falling fast. Long rates falling and short rates steady may mean the tightening cycle is coming to an end. Or it might if the Fed paid attention. My guess is that they’ll ignore the warning of the yield curve this cycle just as they have in the past. And that will lead to recession and a repeat of the cycle all over again. One possibility we have to consider though. The yield curve has gotten more attention this cycle than ever before; everyone knows about the yield curve now. That may mean it has less predictive power than it has in the past. I still think it will work but I’ve been doing this a long time and I’ve seen this before. Something works for years or decades and as soon as it becomes popular it stops working. That’s why we don’t rely on any one thing to analyze the economy. Credit spreads widened modestly since the last update, up about 30 basis points. As you can see though that doesn’t really change much in the overall trend. Spreads have been essentially marking time since early 2017. That is similar to the period from 2005 to 2007 in the last cycle. As I’ve pointed out before, the spread has bottomed at lower levels in the last two cycles so there is room for further improvement. In the last cycle, spreads hit their lowest about the same time the yield curve inverted. The dollar was essentially unchanged over the last couple of weeks and has been bumping up against resistance for a little over a month. 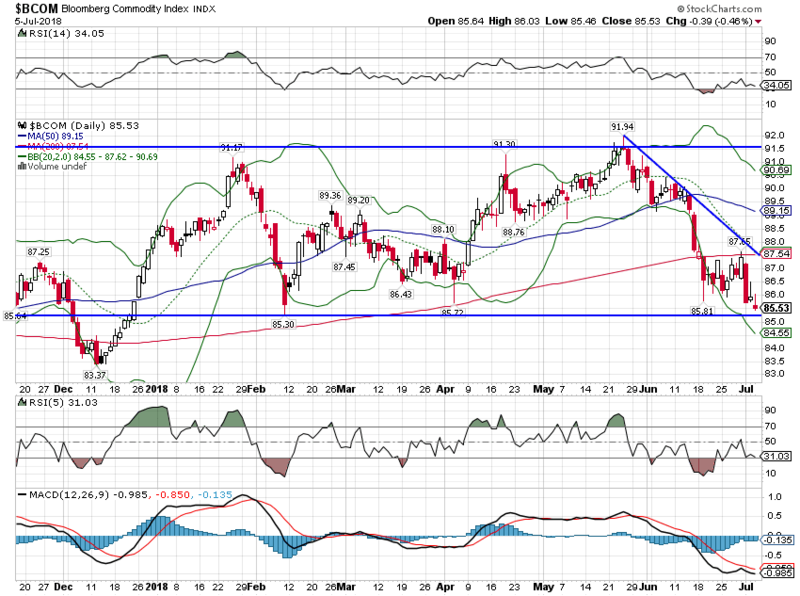 The dollar is likely being driven by the trade tiffs so whether it breaks out or resumes its downtrend may well depend on the outcome. Theoretically, US tariffs should be positive for the dollar as foreign currencies adjust to offset the tariffs (no, there is no free lunch Mr. Trump). However, with other countries looking to retaliate the foreign exchange impact is harder to figure. I’ve said for some time that as long as the President expresses a preference for a weaker dollar – and a preference for a stronger Chinese currency is the same thing – then the dollar will ultimately resolve lower. 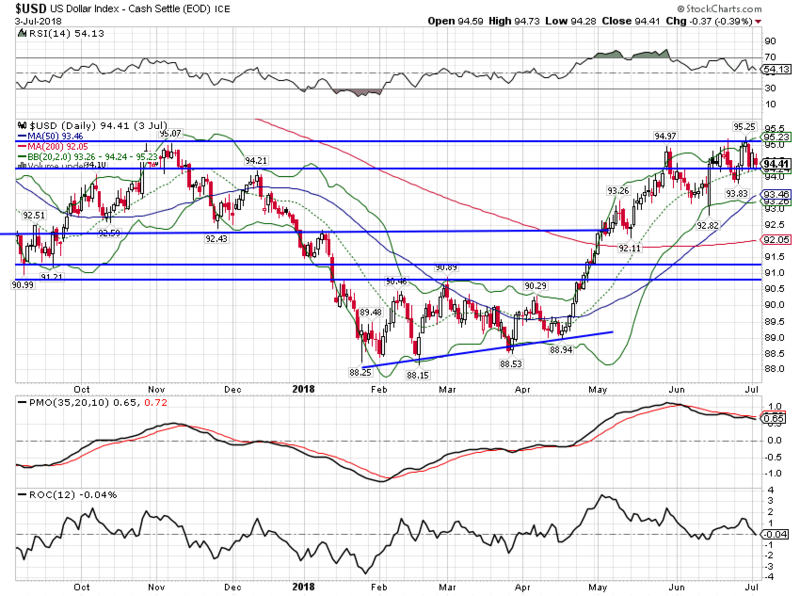 President Trump has given me no reason to believe he wants anything but a weak dollar so until proven different I am going to assume this is a counter-trend rally destined to fail. 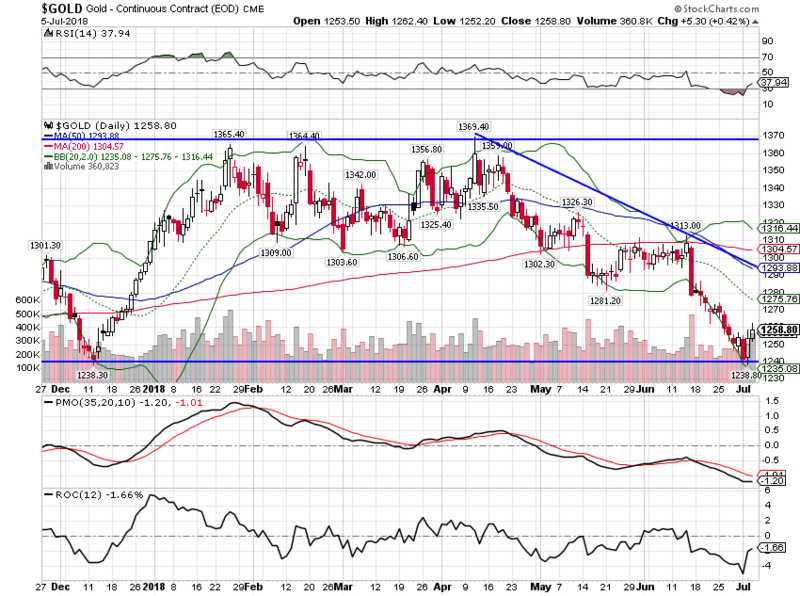 Gold finally succumbed to the stronger dollar and pushed strongly lower. Is this a deflation scare? Dollar liquidity issues? Maybe both but I don’t expect this to last. Monthly momentum is still positive but this is about as low as it can go and that stay true. 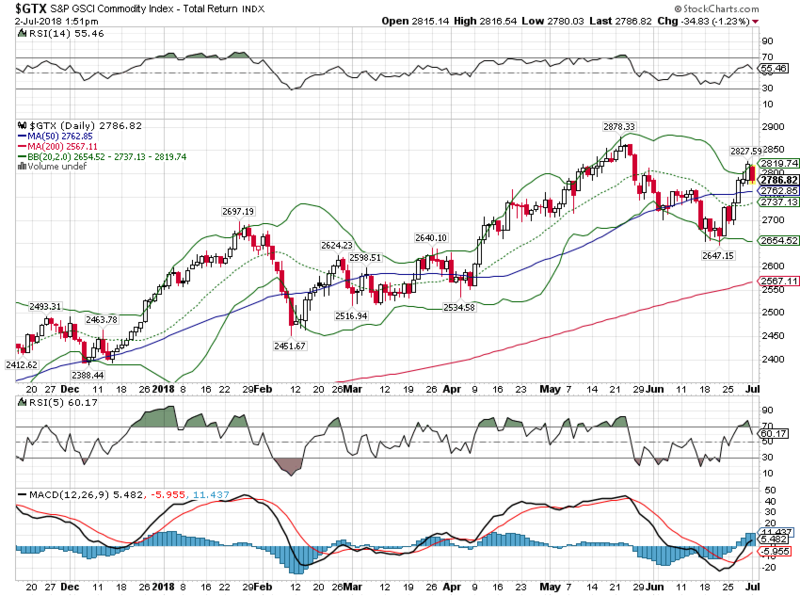 The GSCI commodity index has maintained its uptrend due to oil prices. 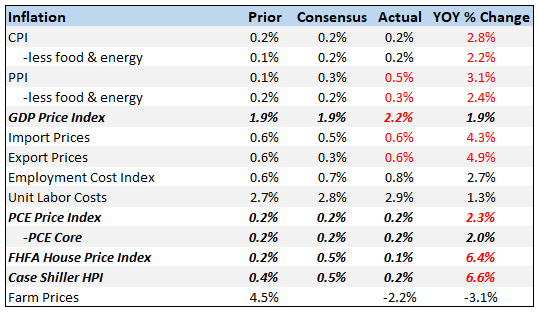 The broader based Bloomberg index hasn’t done as well as other commodities have responded to tariff threats among other things. 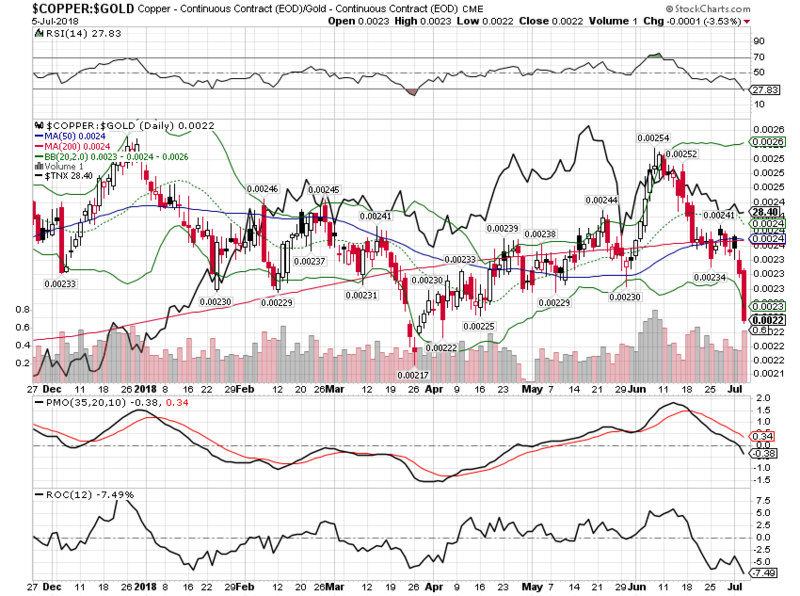 Gold has performed poorly but copper has done even worse. This is generally a pretty good growth indicator and also a handy leading indicator for bond yields. Is this all trade fears? If so, it could reverse quickly if a deal gets done. Chances on that? Pretty slim if you ask me but hopefully I’m wrong. The economic data and the markets both show a slowdown in economic activity recently. Is it a slowdown that will develop into a recession? I can’t answer that question but I would say that a slowdown has to precede a recession. The pace of change is different in every cycle but it is rare to see an economy go from growing above trend to recession overnight. There is always a transition period where growth slows but stays positive. So while this slowdown probably isn’t the entry to recession – the yield curve says we aren’t there yet – it certainly makes us more vulnerable to a shock. Are tariffs and the retaliation they invite a sufficient shock to the system? I don’t know but the Trump administration seems determined to find out.